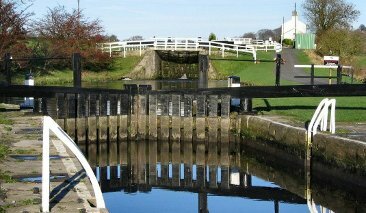 TODAY sees navigation restriction on three major Leeds & Liverpool Canal flights. From this morning, Friday, Canal & River Trust report that 'due to the continued warm weather and low levels of rainfall, the reservoir holdings for the Leeds & Liverpool are very low. To manage the water resources going forward, starting (29 June 2018) overnight restrictions will be implemented', Keith Gudgin tells us. This means that there will be no access to most of the flights before 10am and after either 4.30 or 5pm. This includes Barrowford Flight (pictured) with the last boat allowed at 4.30pm; Greenberfield Flight with the last boat allowed at 5pm; Bank Newton Flight with last boat allowed at 5pm. Boaters must then navigate the flights by 6pm, at which time they will be chained-up until 10am the following day. There are moorings at both the top and bottom of the flights.